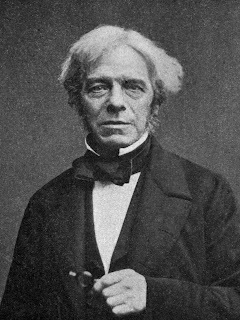 The original transcript of the lecture (or at least a version thereof found online) uses the words “your fellow-men” rather than “humankind,” the latter appearing in the book “Michael Faraday’s The Chemical History of the Candle with Guides to Lectures, Teaching Guides & Student Activities” by Bill Hammack and Don DeCoste. There is another condition which you must learn as regards the candle, without which you would not be able fully to understand the philosophy of it, and that is the vaporous condition of the fuel. In order that you may understand that, let me show you a very pretty but very commonplace experiment. If you blow a candle out cleverly, you will see the vapor rise from it. You have, I know, often smelt the vapor of a blown-out candle, and a very bad smell it is; but if you blow it out cleverly you will be able to see pretty well the vapor into which this solid matter is transformed. 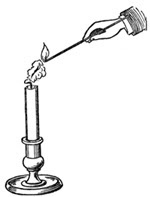 I will blow out one of these candles in such a way as not to disturb the air around it by the continuing action of my breath; and now, if I hold a lighted taper two or three inches from the wick, you will observe a train of fire going through the air till it reaches the candle (FIG. 56). I am obliged to be quick and ready, because if I allow the vapor time to cool, it becomes condensed into a liquid or solid, or the stream of combustible matter gets disturbed.